what if the clothes you wore could change the life of a girl in sierra leone? Hawa is a vivacious, young girl with big dreams of becoming a lawyer. Her home is Sierra Leone, a small country still on the mend after being torn asunder by a decade-long civil war. Known for its abundance of minerals and diamonds, it is ironic that life in Sierra Leone is far from glittering. A few years ago, a band of rebels razed Hawa’s village and massacred her parents, relatives and friends. A previously comfortable life suddenly plunged into a hand-to-mouth existence for Hawa, who was forced to live on the streets. For two years, Hawa trudged on burning soles through days of heat and rain, wandering aimlessly with outstretched hands, begging for a morsel of food to fill a stomach so empty that it felt impossibly light. With no roof over her head, Hawa was left with two choices: to die on the streets, her body subject to a harsh climate and marauding rebels, or to join a brothel to rest her tired head and seek temporary shelter. So a brothel she joined. A few days at the brothel soon turned into two years at the hands of rapacious men. As their clammy hands roughhoused her – their breath reeking of alcohol, their eyes glazed over with drugs – Hawa began to wonder if this was all that her life would amount to. This was her life until a strong local woman called Sia extended her hand, giving her a place to sleep and food to eat. Sia empowered Hawa to get out of the brothel and back into school. One Girl is a Melbourne-based not-for-profit organisation that helps young girls secure their right to education. Every year, One Girl organises a fundraising campaign that invites participants to complete challenges in school dresses for girls’ education. Since it began in 2011, the campaign has seen over 2,500 participants from all over the world raise just over $1 million for One Girl’s education projects, which currently operate in Sierra Leone and next year will expand into Uganda. Sierra Leone is one of the worst places on Earth to be born a girl. The barriers that girls face to accessing education are huge. In Sierra Leone, a girl is more likely to be sexually assaulted than she is to attend high school, resulting in the burdens of teen pregnancy and sexually transmitted diseases like HIV/AIDS. With poverty so high, families can often only afford to send one child to school. Girls are routinely married off to older men, and if that wasn’t hard enough, basic things like access to menstrual hygiene products are so scarce that girls often drop out of sheer embarrassment of having to attend while on their period. Educating young girls is the panacea to all of Sierra Leone’s problems. By sending a girl to school we are not only teaching her to read and write, but we’re empowering her to stand her ground and make her own choices. An educated girl is three times less likely to contract HIV/AIDS. By staying in school, she is safe from sexual assault and she will marry later and go on to have fewer, healthier children. For every extra year of schooling, her income will increase by 10–25 per cent, which she will then reinvest 90% back into her family. By doing so, she will ensure that her sons and daughters continue on this cycle of prosperity that she built for herself and we helped create. Last year, One Girl offered Hawa a scholarship to return to school and complete her education. This year, the annual Do It In A Dress campaign has already raised enough to give 518 girls in Sierra Leone vital access to education. Hundreds of participants have completed creative, active and even death-defying challenges to raise funds to educate young girls just like Hawa. 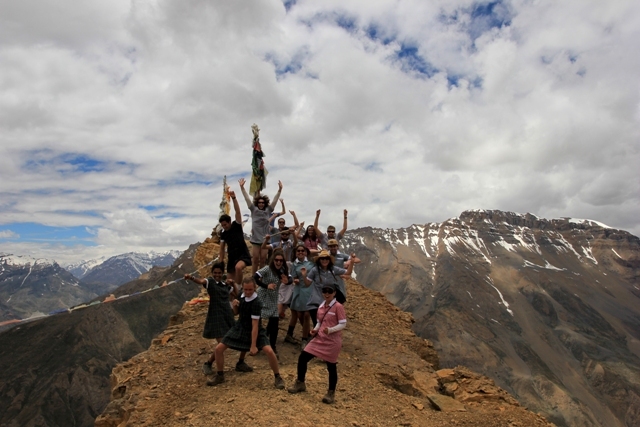 Larissa sky-dived in a school dress; Penny is on her way to climbing Mount Kilimanjaro; Nick and Roman are bicycling through Mongolia to reach France, clocking in 20,000 kms over a period of 10 months and Tomei, just fourteen years of age, is wearing her school dress for an entire month to raise funds and awareness for girls’ education! Aranya Phookan is a media volunteer at One Girl. She joined the organisation this year to help raise community awareness of girls’ education in Sierra Leone. This entry was posted in Get Involved and tagged do it in a dress, education, get involved, one girl. Bookmark the permalink.